This super simple dish is bursting with flavor. 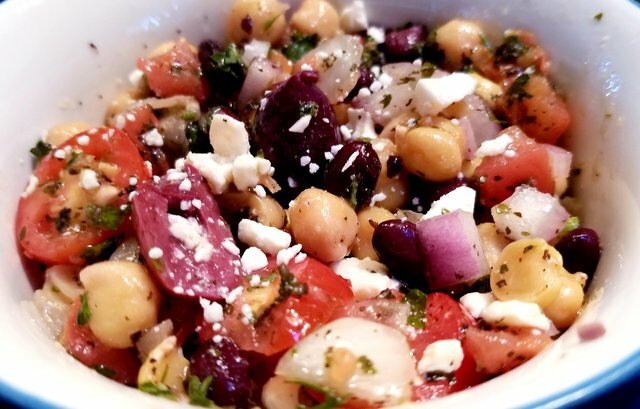 The best part of this meal, other than the flavor, is that it doesn't require any cooking if you use prepared canned beans and chickpeas. The proportions of this recipe is perfect for a side dish for a group of four, but if you are serving a crowd, you can easily double or triple this recipe. Because this dish requires so little effort, can be prepared in under 5 minutes, and can be made well ahead of serve time, it is the perfect dish for busy evenings. In a medium mixing bowl mix chickpeas, black beans, tomatoes, and onions. In a small bowl, mix olive oil, lemon juice, vinegar, salt, and garlic. Mix thoroughly then pour on chickpea/beans mixture. Sprinkle with basil, feta, and mint, stir thoroughly. That is my all time favourite and I add roasted almonds, sultanas and toasted sesame seeds for that added flavour and crunch. That looks so delicious and so beautiful. I have never made an chickpea salad before, so I'll definitely try this out. Supplanting an unhealthy, overwhelming feast with sound plate of mixed greens is an extraordinary method to thin down. Be that as it may, you need to utilize abstain from food well disposed plate of mixed greens fixings. Thanks for sharing this! Ill definitely will try this!